Australian Open 2019: Serena Williams comforts teenager after third-round victory – Royal Times of Nigeria. 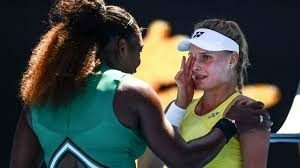 Seven-time champion Serena Williams comforted opponent Dayana Yastremska after powering past the teenager into the Australian Open fourth round. Williams beat the eighteen-year-old Ukrainian six-two, six-one in one hour and seven minutes and did not drop a service game. The American will face Romanian world number one Simona Halep next after she beat Serena’s older sister Venus. Cologne and Asenal both charged by UEFA.